There’s little doubt that those pursuing any type of criminal justice degree are passionate about the law. 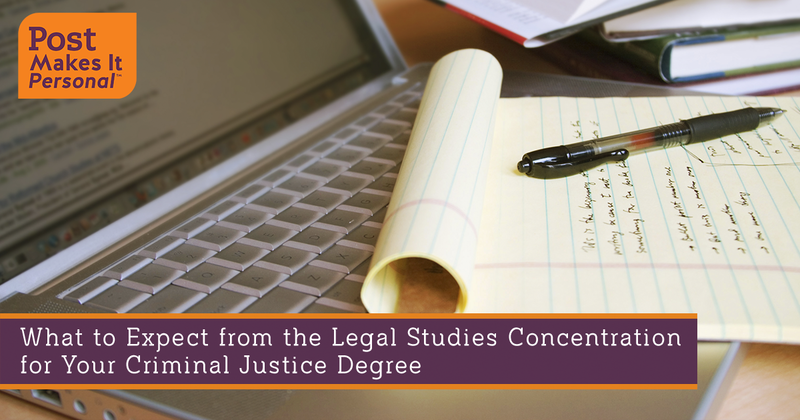 A Legal Studies Concentration can open the door into more insight into this field and creates an opportunity for students to see its impact on day-to-day life. Sandra Wilson, JD, Program Chair for the Post University Criminal Justice program, shares some insights into what a Legal Studies Concentration in a BS in Criminal Justice means to those in the program. What Will You Learn in a Legal Studies Concentration? Those who enroll in the Legal Studies Concentration will gain an understanding of the fundamental principles of law. They will analyze the role and the function of the American legal system. Students will also cover the criminal justice system and the functions of each branch of government. They’ll learn how to analyze and apply the laws created in the U.S. Constitution to today’s modern issues. And they’ll take a look at theories concerning the causes of crime and the impact of criminal penalties on society and those penalized. What Kinds of Projects Will You Work On? Class projects for the legal studies concentration will help students demonstrate their understanding of ethical as well as professional responsibility in a number of key areas. They will participate in numerous discussions and engage in ongoing debates about many of the hot topics that arise today within the legal system. With the foundational education they receive from this program, students will also be able to communicate and write about the criminal justice system and the numerous principles that are defined within the U.S. Constitution. A review of these skills is done in numerous ways including research but also through an interactive environment. Who Should Consider This Concentration? Maybe you. After all, this type of program can be a stepping stone into a number of career opportunities. Those who graduate from the program will be able to work in a variety of positions in courtrooms, for example. Or it could transition into work as a paralegal. This degree program, and this concentration, could also serve as a step toward law school. Graduates may want to expand their knowledge and determine their interest in a formal law education, such as working as an attorney, a prosecutor, or a judge down the road. With a Legal Studies Concentration, they can gauge their level of interest in the field and best determine their next steps. Why Should Someone Be Excited About This Concentration? What Type of Value Does it Add? While many use a BS in Criminal Justice to pursue a legal career, others see it open other doors to other types of career opportunities, such as in the U.S. Post Office, corporate security, or employment within a state or federal corrections field. There are any number of positions that can be had with an education focused in law. According to the U.S. Bureau of Labor Statistics, court reporters— a position a BS in Criminal Justice with a legal studies concentration can help you pursue — averaged $55,120 in 2017. Court reporters work in trials and other legal proceedings to document events. They create transcriptions of the proceedings taking place. They can also work in corporate positions or in classrooms providing similar services. Workings as a paralegal is another step some may take with a Legal Studies Concentration. Paralegals or legal assistants support attorneys and legal teams by organizing and maintaining files. Other duties may also include drafting legal documents and conducting the legal research these legal teams need. According to the BLS, In 2017, pay for paralegals and legal assistants averaged $50,410. And the field is expected to grow by 15 percent from 2016 to 2026, a rate that is much faster than other fields. This area is also an excellent starting point for those who wish to enter law school. By taking this program, it may provide insight into what a student can expect from a law career. It can also help the student to boost his or her resume when applying to a law school. What Type of Skills and Experience Does the Faculty Members Have to Bring to This? At Post University, our criminal justice faculty are experienced, well-respected experts in the field. They offer a wealth of insight gained from real-world experiences. Many of our law instructors are attorneys and judges, providing some of the highest levels of educational opportunities possible. If you’re interested in legal studies, but not sure where your future lies, a Legal Studies concentration within a comprehensive criminal justice undergraduate degree program is a solid starting point. It can also be an excellent opportunity to begin working in the legal field right away. To learn more about taking the first step toward a legal career in the field of criminal justice, take a deeper look at the opportunities a Legal Studies concentration can provide.